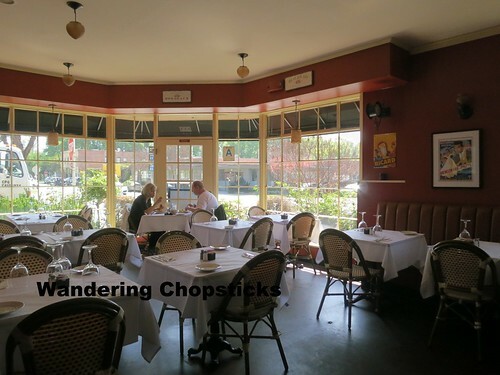 Before my mom left town, my brother wanted to meet up for a family brunch at Bistro De La Gare Restaurant & Wine Bar in South Pasadena. So called because it's next to the gare ie. train station in French, the Mission Street Gold Line stop. 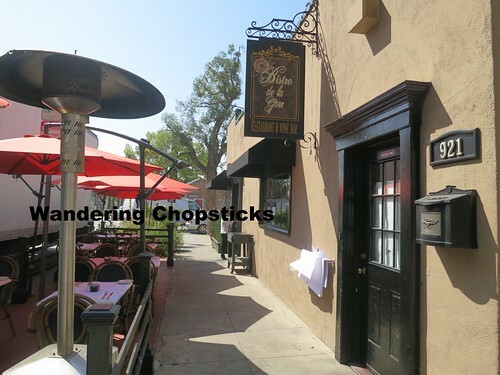 The restaurant is nestled between Nicole's Gourmet Foods and a nursery so plenty of potted plants and trees abound. Very cute. 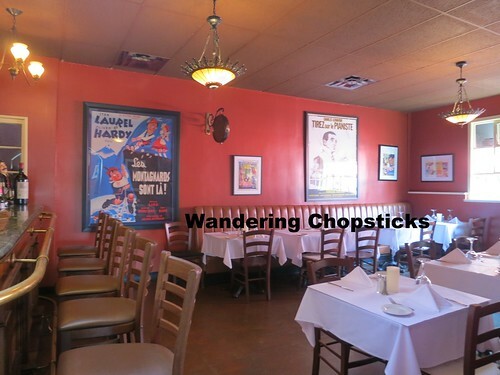 The interior, with its red walls and French posters, gave a very bistro-like feel. See? Very cute! It was shortly after 10 a.m. so besides this couple, we were the only other customers. 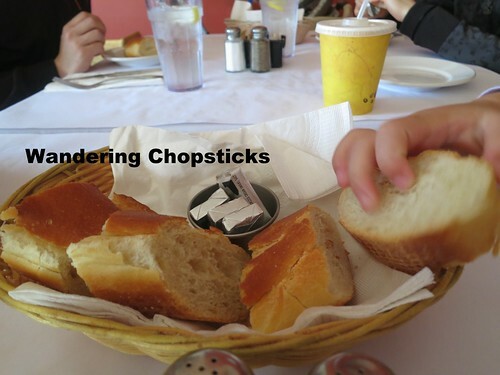 French bread and butter while we waited for our orders to come out. 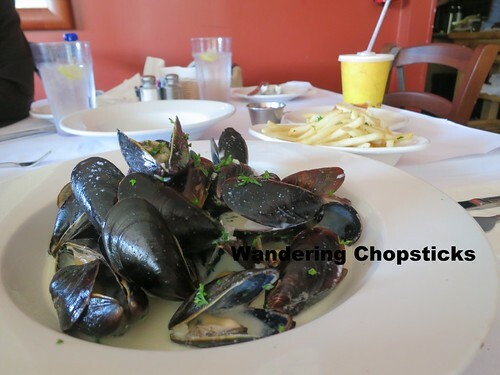 We got an entree order to share as an appetizer of moules marinere (French steamed black mussels cooked in white wine and cream with shallots and served with a side of garlic fries), $14.50. 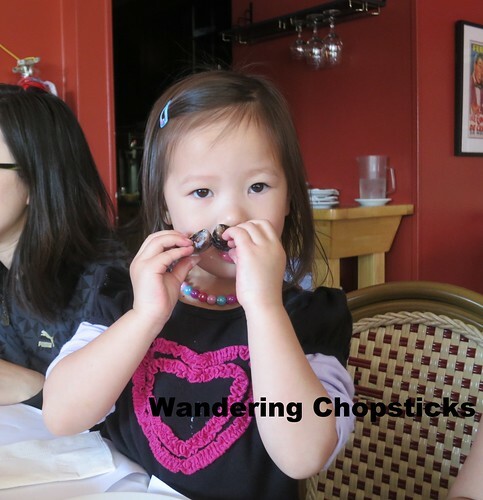 The niece loooved the mussels. She slurped every bit and said "want more" when the plate was empty. This was a big hit with the rest of the table, but my family likes our seafood so no surprise there. 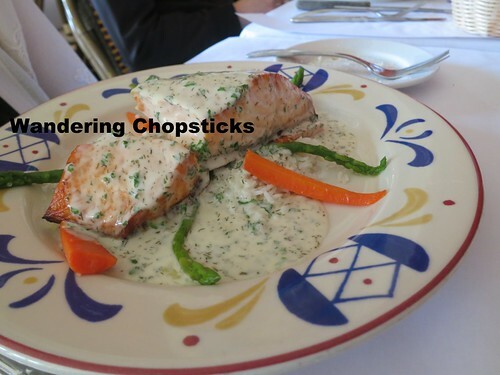 My mom ordered saumon au beurre blanc (French sauteed salmon in white butter sauce over basmati rice with steamed vegetables), $14.50. This was fine, but lacked the sophistication of the beurre blanc I got with my fish at Church & State Bistro - Los Angeles. 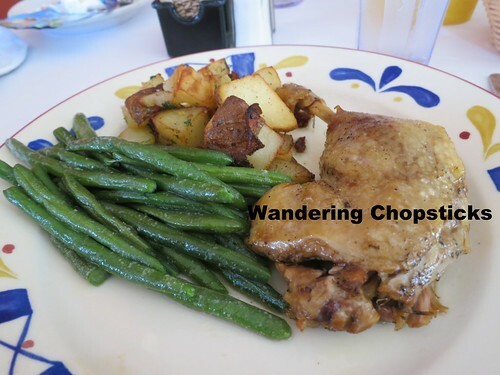 My brother ordered canard confit (French duck confit served with chef's selection of daily steamed vegetables), $16.50. The duck was fall-apart tender, but bland; needed salt. 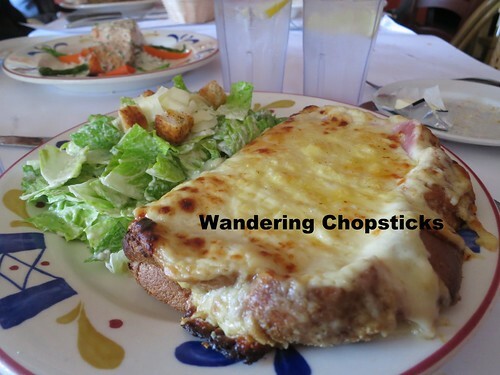 I got the croque monsieur a la Parisienne (French class open-faced ham sandwich with melted Gruyere and Bechamel), $8.50. Warm melted cheese over ham and bread, what's not to love? I think I got the winner of the bunch since the cheese and ham had lots of flavor. The bread was thick and hearty, crispy on the bottom, to stand up to the melty cheese. 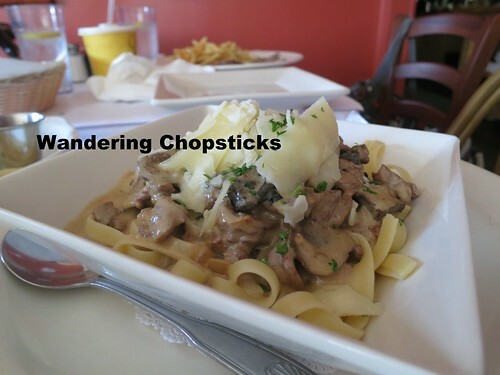 Lil' sis ordered pates a la forestiere (French sliced beef cooked in a white wine cream sauce with mushrooms over fettuccine pasta), $12.50. The beef could use a little more seasoning, but the creamy mushroom sauce saved this dish. 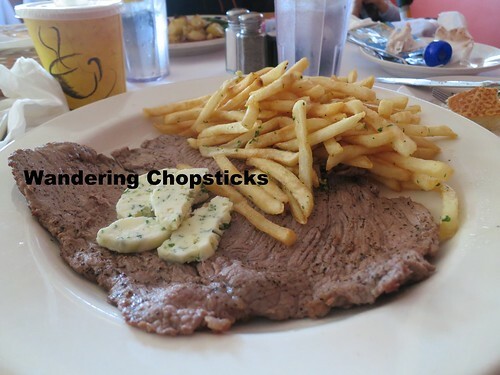 My brother's wife ordered le steak frites (French sauteed top sirloin steak with garlic and parsley butter served with garlic fries), $14.50. Again, the steak was bland. I don't even use that much salt in my cooking, but the meats here really need to be salted because, while cheese can help with the saucy dishes, the simple meat entrees really lacked flavor. Also, this steak was super thin, which the description doesn't really make clear. We were full, so opted not to get dessert. 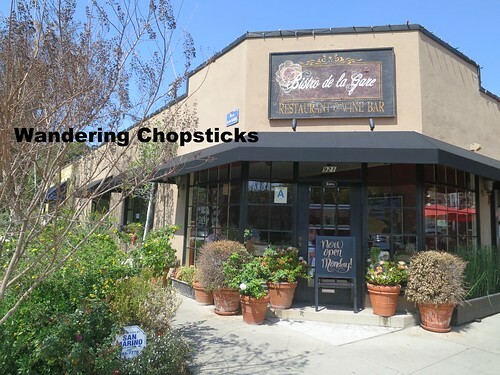 Overall, I think Bistro de la Gare is a cute local restaurant, certainly in keeping with the South Pasadena neighborhood. I would recommend sticking to the dishes with sauces and creams, unless you have a blander tongue than mine. The waitstaff were super nice, which is always a bonus. And if you have kids who like trains, you can sit on the sidewalk and see trains go by quite frequently. 3 years ago today, Central Vietnamese-style food at Ngu Binh Restaurant - Westminster (Little Saigon). 4 years ago today, souvenir from my brother Costa Rican guava and passionfruit chocolates. 5 years ago today, Bollini's Pizzeria Napolitana Redux (Tasting Menu) - Monterey Park. 6 years ago today, Saigon Bistro redux. Fun visit -- and inspiration for your Belgian moules frites? Yup! That and because the mussels were on sale. Couldn't pass up such a bargain.